New Delhi: Finance minister Arun Jaitley on Monday said the next stage of reforms of the goods and services tax (GST) would see the standard rate converging to around 15%—the midpoint of the existing standard rates of 12% and 18%. If indeed this happens, India will have all but achieved the idea of “one nation, one tax". At present, the transition to GST has ensured “one commodity, one tax"—unlike in the preceding regime where each commodity would attract up to 17 taxes. After the rejig of rates on Saturday, 97.5% of commodities are taxed at 18% or less. The standard rate is the tax rate that covers most items. 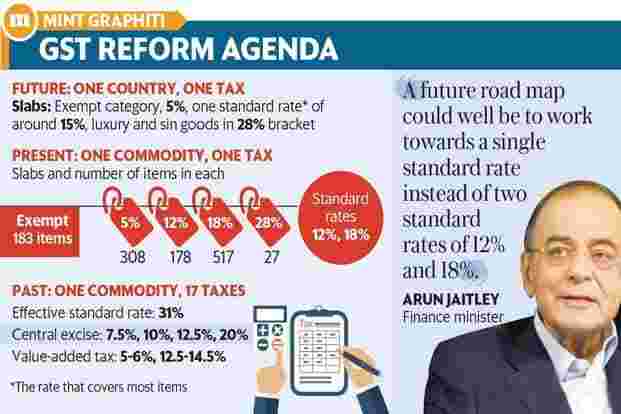 “A future road map could well be to work towards a single standard rate instead of two standard rates of 12% and 18%," the finance minister said in a Facebook post on Monday titled “18 months of GST". “It could be a rate at some mid-point between the two. Obviously, this will take some reasonable time when the tax (revenue) will rise significantly. The country should eventually have a GST which will have only slabs of zero, 5% and standard rate with luxury and sin goods as an exception." Lowering the tax rate on cement from 28% to a lower slab was, however, a priority, Jaitley said. According to Jaitley, under the value-added tax (VAT) regime the effective standard rate of taxation was 31%, besides the fact that the same commodity was taxed differently across the country. The finance minister’s statement is in response to criticism from the opposition Congress that the new indirect tax with four rates—5%, 12%, 18% and 28%, besides a list of exempted items and cess on certain products—is a complex tax system and that it should have been capped at 18%. GST was implemented on 1 July 2017 as a four-slab system as the Union and state governments were unsure about the revenue impact. The 13th Finance Commission chaired by former finance secretary Vijay Kelkar had proposed a single rate of 12%. Singapore has adopted a single GST rate of 7% and the UK has two rates—5% and 20%. Experts say that most countries have one standard rate and one lower rate for GST and the idea of converging the 12% and 18% rates is welcome. “Chief economic adviser (Arvind Subramanian) had in the past suggested a revenue-neutral rate between 15% and 16%. Hence, the intention to move to that rate would be very welcome," said M.S. Mani, partner, Deloitte India. Since the July 2017 implementation, GST rates were sharply cut on many items. After Saturday’s reduction, the highest slab of 28% has only 27 categories of products, down from close to 228 at the time of the rollout of GST. In a reference to Congress’s criticism, Jaitley said that those who oppressed India with a 31% indirect tax and consistently belittled the GST must seriously introspect. “Irresponsible politics and irresponsible economics is only a race to the bottom." Prior to GST rollout, most goods attracted a 12.5% excise duty and a 14.5% state VAT. This, together with the cess on interstate transfers and the effect of tax on tax, had led to a tax burden of 31%, the minister said. “We were faced with a situation with a large number of commodities being taxed heavily in the pre-GST regime. The Congress legacy of indirect tax was a 31% tax," Jaitley said, adding that as revenue collections improved rates were lowered. “Our next priority will be to transfer cement into a lower slab. All other building materials have already been transferred from 28% to 18% and 12%. The Sun is setting on the 28% slab."